Please join the General Staff in congratulating the most recent Texas Army member to qualify for his commission as Colonel. 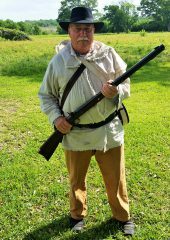 Howard has completed the requisites of participating in a minimum of 5 qualifying scheduled events, and a week ago Saturday he made 5 consecutive shots into a 9 inch plate using his Lyman muzzleloader. General Emmitte, Colonels Hankla and Roberts were present, along with Rusty McLaughlin and Rion Braddock. Howard will be awarded his commission at the San Jacinto ceremony next spring. We will have several more qualifying shooting events throughout this season. General Emmitte anticipates another range day for November, 2017. Stay tuned for further details. If you have participated in at least 3 scheduled qualifying Texas Army events, and you have interest in doing your live-fire shooting qualification, please contact General Emmitte.